Ok so it's obvious that today's Makeup Monday isn't about makeup but about hair care. Both are in the beauty family though so I think we're good. I wanted to talk to to you guys about a few products I'm obsessed with right now. I do my best to make sure my hair stays healthy and strong and these products absolutely do the job. This leave-in conditioner makes my hair smell amazing and feel very soft. I will use a little after I wash my hair. I will also rub a little on my palm and work it into my hair when its dry. It's such an affordable way to keep your hair healthy and strong. Especially in dry places, like Utah! You guys! The Wet Brush is amazing!! I have pretty thick hair and it will definitely get tangled if I don't brush. It really is like magic! No just kidding, it uses IntelliFlex bristles which work like magic. This brush is seriously a game changer. Obviously to go with the Wet Brush if your hair is dry. I'm ripping out less hair every time I brush and it's wonderful! 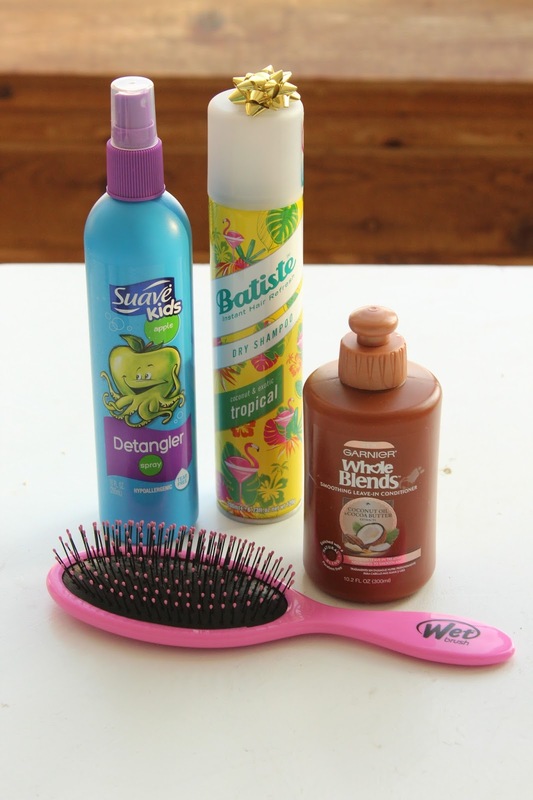 Plus this Kids' Detangling Spray smells SO good. If you don't want to go buy this, your little sister may already have it. True story. Dry shampoo is a busy girls best friend. I've tried so many different brands and I'm totally hooked on Batiste. It works so well and my hair looks better every day. The extra volume doesn't hurt either! These 4 are my must have hair care products right now. Check them out and let me know what you think!